← Convert prn to bmp and rotate page via command line? This article aims to introduce two methods to convert HTTP link to PDF and protect PDF. When the web page is open, press Ctrl+P to open the Print dialog box. Select Adobe PDF in the Printer Name combo box and press OK to open the Save As dialog box. In the Save As dialog box, save the web page as PDF file. Open the Properties dialog box by double clicking the icon of the PDF file you want to protect and then click Properties. 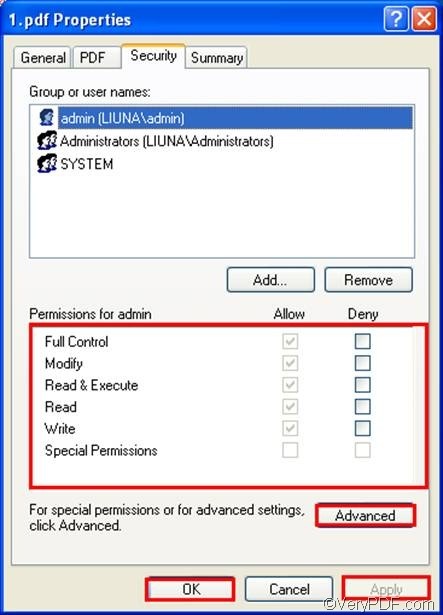 Click the check boxes under Permissions for admin to prevent PDF being modified, read, write, etc. or click Advanced to do advanced settings. If you don’t have Adobe Acrobat, you can free download VeryPDF HTML Converter Command Line to solve your problem. VeryPDF HTML Converter Command Line does not require any third party application, and it provides multiple options to protect PDF via command line. Most importantly, it only takes two steps to help you convert HTTP link to PDF and protect PDF. In Windows XP, you can open the command prompt window as follows: click Start > select Run > type “cmd” > click OK.
You should type a command line according to the following basic usage: htmltools [options] < HTTP link > [<PDF file>]. If you want to see more options, please type the whole directory of the executable file in the command prompt window. After you type a command line, depending on your requirements, please click Enter to start converting and password setting. The free trial version can only be used to multiple times. If you want to buy VeryPDF HTML Converter Command Line, please click Full Version. How to print html to PDF? This entry was posted in HTML Converter (htmltools) and tagged command line, HTTP link to PDF, protect PDF. Bookmark the permalink.